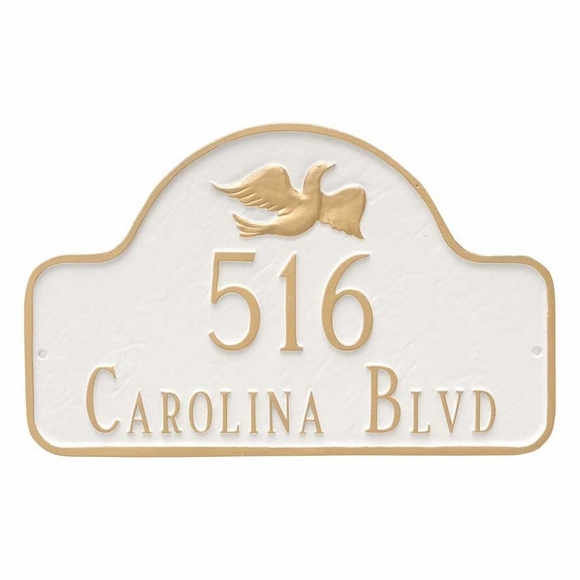 Arch Address Plaque with Dove - - arch shape sign personalized with the address you specify. Wall mount or lawn mount with optional lawn stakes. Made in USA. Peace theme address sign includes a dove emblem inside the arch. Line 1 holds up to five (5) 5" characters. If you do not want to use the second line, please leave the Line 2 input box empty. The thin border accents the arch shape and is the same color as the dove. Personalized address plaque with dove. Arch shape. Wall or lawn mount. Made in USA.